Spend a day (or two…or three…) visiting Yosmite National Park (YNP) and seeing all the famous spots: Tuolumne Meadows, Tenaya Lake, Olmsted Point, Half Dome, El Capitan, the beautiful waterfalls of Yosemite Valley, and the Mariposa Grove of Giant Sequoias. Tioga Pass (Highway 120 W) is the spectacular route from Mono County to YNP, winding up from Highway 395 and Lee Vining Canyon to almost 10,000’ (9,943’ to be exact) before it reaches the east entrance gate. An entrance fee is required. Another option is to hop on a YARTS bus (from Mammoth Lakes, June Lake, or Lee Vining) and let the tour-style buses do the driving while you sit back and enjoy the incredible views. The bus ticket includes your park entrance fee. (www.YARTS.com or 877-989-2787). Tioga Pass (Highway 120 W) closes in the winter. Check the YNP website or Caltrans road conditions (800-427-7623) before travelling. Your YNP entrance fee is good for seven consecutive days! 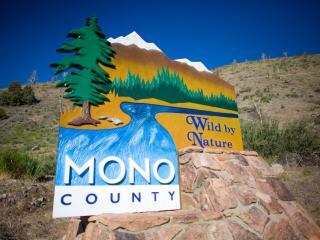 Don’t rush it, and come and go as you please during your trip to Mono County. You can also buy your entrance pass (or season pass) at the Mono Basin Scenic Area Visitor Center in Lee Vining and talk to Park Rangers there before you enter the park. The Mono Lake Committee Visitor Center is another good stop for information, located on Hwy 395 in Lee Vining. There is a YNP visitor center at Tuolumne Meadows as well. Lee Vining is your last stop to fuel up before entering the park. Next fuel stops are Wawona, Crane Flat, and El Portal. Saddlebag Lake & the Twenty Lakes Basin loop trail – gorgeous every step of the 5 to 8 miles, the trail passes by 20 lakes, giving this trail its name. Take a water taxi from Saddlebag Lake Resort across the lake to shave off a few miles! Tioga Pass Resort Café: this historic lodge, built in 1914, serves up delicious comfort foods and world famous pie! 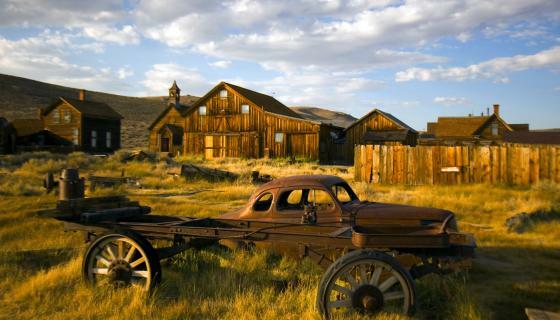 Visiting Bodie is the most authentic way to see the real-life setting of the California gold rush – it’s the largest unrestored ghost town in the West. From 1877 to 1888, Bodie was a bustling town with more than 10,000 residents and produced more than $35 million in gold and silver. Today, with the gold mining days of California a distinct memory, there are 170 wooden buildings to photograph and explore. Peek in the windows of the church, schoolhouse, barbershop and saloon, where bottles, desks and other relics remain. Bridgeport is the closest town with services and lodging. There are no services at Bodie, so be sure to have plenty of gas, water, snacks, sunscreen, layers, etc. Cell service is spotty at best. The park is 13 miles east of Highway 395 – 10 miles of winding paved road and three miles of unsurfaced road, that can be slow and bumpy, but is suitable for all vehicles. The park is open year-round (summer & winter hours apply) but Highway 270 will close with snow. Check Caltrans road conditions (800-427-7623) before travelling. There is a small park fee payable to the ranger or at the honor-system self-pay box at the parking lot. Historic Downtown Bridgeport: Home of California’s second oldest courthouse (built 1880) that’s still in use (great photo op! ), Bridgeport is a town steeped in history and charm. Stop by the Bridgeport Library for visitor information, walk over to the Mono County Museum (featuring displays on the region’s Native America, mining, and ranching heritage), and grab a bite to eat at one of the mom-and-pop spots along Main Street. The Old Fashioned Fourth of July parade and celebration is worth a trip alone, too. Twin Lakes: From the north end of Bridgeport, drive out of town on Twin Lakes Road. The scenic 10 miles follows gorgeous grazing land with a backdrop of the Sawtooth Range, passing by the Hunewill Guest Ranch, dating back to 1861. In about 15 to 20 minutes, you’ll see the Twin Lakes nestled in the mountains. Stop in at Twin Lakes Resort to rent a boat or paddle board, have a picnic, grab a pole and fish for rainbows, browns, and even Kokanee salmon! Travertine Hot Springs: Travertine Hot Springs lie on California State Park land just off Hwy. 395 south of the town of Bridgeport . It is one of the easiest hot springs to get to and features a stunning view of the Sierras while you bathe. All types of people visit Travertine, including the nearby park rangers, campers, families, couples, and single travelers. Limited camping space is available on the short dirt road leading to the hot springs, but is not allowed in the immediate area of the pools. Take Hwy. 395 south of Bridgeport about 0.5 miles Turn left at Jack Sawyer Road, just before the Bridgeport Ranger Station. Follow Jack Sawyer Road approximately one mile. Road may close or be difficult to travel on with snow. 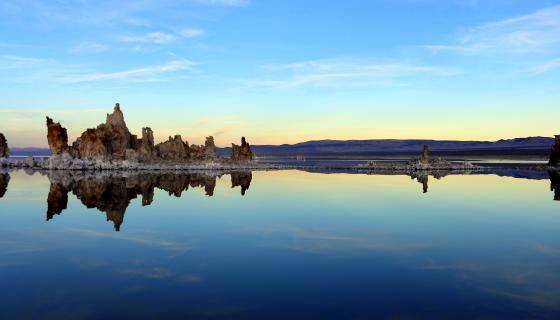 Mono Lake is a majestic body of salt water covering 60 square miles. It is an ancient lake over 700,000 years old and is 2 1/2 times saltier as seawater. Mono Lake sustains a unique biosphere where tiny brine shrimp and alkali flies provide food for millions of migrating birds. Mono Lake is also home to the unique tufa towers that have formed in the lake, making the landscape truly fascinating. The perfect way to learn about this fragile habitat is through the interactive displays at the Mono Basin Scenic Area Visitor Center, on U.S. 395 in the town of Lee Vining. The South Tufa Reserve is your next stop after the Visitor Center – take Hwy 395 south out of Lee Vining and turn left onto Hwy 120 East. The June Lake Loop drive is approximately 15 miles of dramatic Sierra peaks and alpine scenery with a chain of gorgeous lakes (north to south route lake order: Grant Lake, Silver Lake, Gull Lake & June Lake) all nestled in a steep horseshoe-shaped canyon. Especially impressive in the fall, this is a must-do detour any time of year – or the perfect place stay a little longer. There is fishing, hiking, boating, horseback riding, camping, stores, restaurants, and plenty of photo ops. The scenic loop can be done in either direction, starting at the northern junction with Hwy. 395, which is 10 miles south of Mono Lake, or the starting from the southern junction with Hwy. 395, which is about 15 miles north of Mammoth Lakes. The loop will close from roughly Silver Lake to Grant Lake in the winter, so check road conditions before traveling – and if it is closed, make a smaller loop by entering the town of June Lake from the south junction, and turning right on North Shore Drive, to see beautiful Gull and June Lakes. Hop on the shuttle bus (mandatory in peak summertime months to alleviate traffic congestion in the tiny valley and navigate the steep and narrow route) at the Mammoth Mountain Adventure Center. There is a small fee to ride – get more information at Devils Postpile NPS website or by calling the Mammoth Lakes Welcome Center. Take a ride with the Reds Meadow Pack Station, access the Ansel Adams and John Muir Wilderness areas for incredible backcounty hikes and overnight adventures (overnight permit required), or find a cozy first-come-first-served campsite to make the valley your home base. Devils Postpile is a unique geologic feature, formed 100,000 years ago by an eruption of lava. The lava cooled uniformly, leaving surface cracks, resulting in vertical hexagon-shaped basalt columns. Devils Postpile is a short, easy half-mile hike from the trailhead at the Ranger Station. The National Parks Service offers interpretive tours, a ranger station, picnic area, restrooms and a campground. Rainbow Falls: The San Joaquin River tumbles over an abrupt 101-foot lava ledge with rainbows appearing all over the rising mist. The best time to experience the rainbows is midday when the sun is the highest. 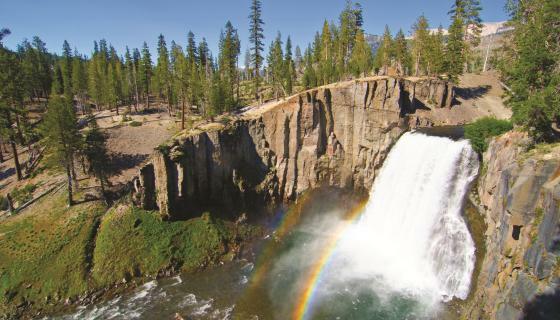 You can ride the shuttle to the Rainbow Falls trailhead and hig about 1.5 miles to the Falls, or follow the trail from Devils Postpile along the river to the Fall, which is about an additional 2 miles of hiking. The trails are easy, but are soft and sandy and very exposed to the sun – sunscreen, water, snacks, hats, comfortable shoes, etc. are good to bring. Minaret Vista: Approximately 2 miles up from Mammoth Mountain is the Minaret Vista with breathtaking views of the Ansel Adams and John Muir Wilderness Areas. The jutting spires of the Minarets with Mount Ritter (13,157 ft.) and Banner Peak (12,945 ft.), the two tallest peaks in the range. The Minaret Vista is a popular spot for stargazing and during the summer months there are "Star Parties". Restrooms and picnic areas are available. In the winter, this is a popular route for snowshoeing and cross country skiing! Mammoth Mountain Gondola Ride: Take a gondola ride to the top of Mammoth Mountain to an elevation of 11,053 feet! There you will have unbeatable panoramic views of over 400 miles of the Sierra Nevada Mountain Range. Explore the Top of the Sierra Interpretive Center with interactive displays on the area&apos;s geology, hydrology and volcanic history. The gondola ride is only a 15 minute ride from the Adventure Center at the base of the mountain. Dogs on a leash our welcome! Free maps are available at the Adventure Center. Fee required. For more information contact Mammoth Mountain at 800-626-6684. Leavitt Meadows and Leavitt Falls Vista: The views are jaw-dropping from this vista! Have a picnic overlooking Leavitt Meadows and marvel at the multi-tiered falls dropping over 300 feet! Directions: From Hwy 395, about 14 miles south of Walker and about 17 miles north of Bridgeport, turn west onto Sonora Pass (Hwy 108). Drive 8.8 miles to the signed Leavitt Falls Vista Point on the left (south). Good to know: Sonora Pass (Hwy 108) closes during the winter, check Caltrans road conditions (800-427-7623) before travelling. Mountain Gate Park: Located along the shores of the state-designated “Wild & Scenic” West Walker River, the new 15-acre Mountain Gate Park is an easy-pull off of Hwy 395 about two miles south of the small town of Walker. The day-use riverside park provides an accessible pedestrian trail that winds through a par course with four different fitness stations as well as interpretive signage along the path shares the park’s history and the area’s native vegetation and wildlife and bird species. 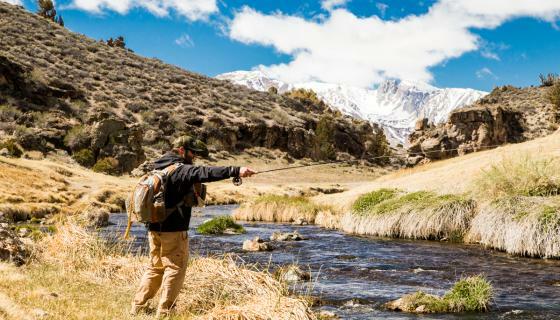 The trail also circles around a central amphitheater that hosts community and special events, and heads down to a 500-square-foot fishing platform that extends over the clear waters of the West Walker River, famous for its excellent trout fishing. Golden Gate Mine: The remnants of this gold mine, which operated between 1903 and 1939, is just a few miles off Hwy 395 but incredible views of the Antelope Valley, it’s a great spot that anyone of any age will have fun exploring – the giant stamp mill, bunk house, mine shaft and ore cart rails all remain, in some fashion, and offer an amazing glimpse into the past. Directions: About half-way between Walker and Coleville on Hwy 395, take Mill Canyon Road west and then stay right at the fork with Golden Gate Road (towards Antelope Pack Station). A little less than 3 miles later, you’ll come up to the abandoned mine. Good to know: The route is a graded dirt road and suitable for all vehicle types, but go slow and use caution if the road is wet or snowy. Hot Creek Geologic Site: Hot Creek is a place to marvel at geology in action. What remains of the ancient Long Valley Caldera blast is a region of fascinating geologic wonder of bubbling hot springs, geysers and fumaroles (gas vents) creating colorful sulfur deposits and formations. The chamber of hot magma lies about three miles below the surface of the earth in this area. The brilliant pools are scalding hot and water temperatures can change rapidly, so entering and swimming in the water is prohibited. Restrooms are available. Located about 10 miles south of Mammoth Lakes off of U.S. 395. Take Airport Road (east) past the airport turnoff. You will pass the Fish Hatchery and continue on a partially paved road about three miles to the parking area for Hot Creek. Half-mile easy hike down to Hot Creek. Hot Creek Fish Hatchery: The warm springs of Hot Creek provide ideal temperatures for incubation of trout eggs. The Fish Hatchery is open from 8:00 am to 4:00 pm for self guided tours. Available for interpretive tours by prior appointment. For more information call the Department of Fish and Wildlife at 760-934-2664. 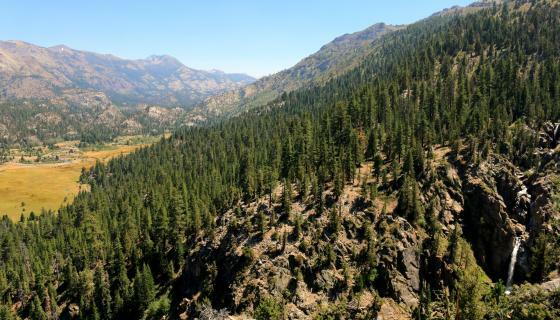 Located about six miles south of Mammoth Lakes off of U. S. 395. Take Airport Road (east) past the airport turnoff. Look for the signs. Convict Lake: Convict Lake is named after the result of an AMBUSH encounter on September 17, 1871, where a group of inmates escaped from prison in Carson City and Sheriff George Hightower eventually caught up with the convicts and a shoot out took place. Robert Morrison a Benton Merchant, Mono Jim and other posse members encountered the convicts on the present Convict Creek. In the encounter Morrison and Mono Jim were killed and the convicts escaped to be captured later in Round Valley. The towering peak above the lake was re-named Mt. Morrison and the smaller one below it Mono Jim. Convict Lakes is popular with camping and fishing. 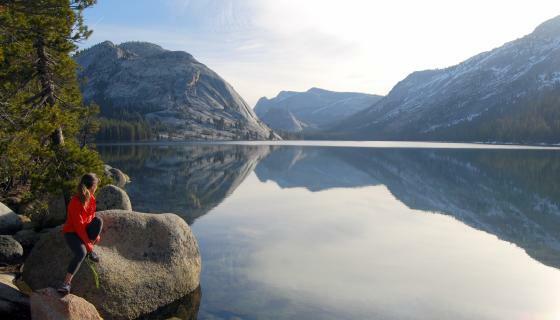 Take a two-mile hike around the lake with views of the rugged mountain scenery with sheer cliffs and the oldest rocks in the Sierra Nevada Range. The Restaurant at Convict Lake is widely recognized as one of the finest restaurants in the Eastern Sierra offering sumptuous continental cuisine, an award winning wine list and a martini bar. Located 10 miles south of Mammoth Lakes off of U.S. 395 turn west on Convict Lake Road.